Not all the quarterbacks are first round types. History has shown us that quarterbacks drafted later than the opening round can become productive pros. To name a few, look at Washington’s free agent-to-be Kirk Cousins and Dallas Cowboy quarterback Dak Prescott. Neither got drafted in the first two rounds of the Draft, yet have become very good NFL quarterbacks. The following are two guys that I have done a lot of work on and I feel will eventually become starting quarterbacks in the NFL. Strong Points –Very productive. Three year starter with 34 starts. Good size. Good athlete with quick feet. Has some speed. Shows a good feel for pass rushers and can extend and make plays with his feet. Has a quick tight delivery with good arm strength. Throws a tight ball. Accurate with good ball placement. Smart and a top leader. Shows he can go through a progression. Processes quickly, is patient and a good decision maker. Has a quick release. Keeps turnovers to a minimum. Lot of upside. Weak Points –Plays at a lower level of comp. Tore his ACL (right knee in game 11 of the 2016 season and missed the rest of the season. While his arm is good, he doesn’t have a canon. He has not taken many snaps from under center. Summation-Kyle is a fifth-year senior and a three year starter. Very experienced with 34 starts. His dad played quarterback for Navy. Kyle has strong leadership skills and is a very hard worker. Strong football character. Has good mechanics and a quick release. Throws with accuracy both short and long. Has completed better than 63% of his throws for his entire career. Always shows good ball placement. Able to go through a progression, is patient and makes good decision. He has a good enough arm but no canon. With his athleticism he can extend and make plays with his feet. Makes big plays when needed. Overall, probably the best small school quarterback in the draft. Played well in the Senior Bowl. Has the talent and intangibles to become an eventual starter in the NFL. At worst he is a quality backup a team can win with. A lot of upside to this player. Brandon Silvers – QB – Troy St.
Strong Points –Four year starter. Has a better than 64% career completion percentage. Touchdown-to-interception ratio is excellent. Very good QB size to go along with good to real good athleticism. Strong arm, throws a tight ball. Poised, has a good feel for pass rushers and can extend plays with his feet. Can make the tight window throw. Strong leader. Does a good job reading defenses and makes good decisions. Throws well on the run. Weak Points –Did not play in a top conference. Age, he will be a 24 year old rookie. Because he trusts his arm, he will force some throws. Plays mostly in a half-field read offense. Summation –Brandon has been at Troy five years and has been a starter for four of them. He redshirted as a true freshman. In my opinion he is one of the more underrated quarterback prospects in this Draft. Played in the Sun Belt Conference but has played well when up against better competition. He is a mature leader with good physical skills for the position. He has a strong arm, is accurate with good ball placement, makes good decision and is a strong leader. Being a four year starter, he has grown and improved every year and is one of the more experienced QB’s available this year. While he won’t get drafted among the top tier quarterbacks, he should go in that second group. Will need time to develop and learn the NFL game but he has NFL starter potential and traits. A very good mid-round pick. 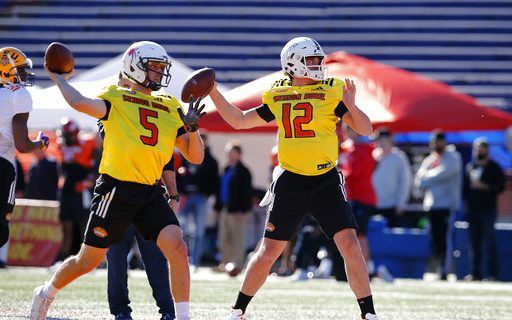 Greg takes a look at the top quarterbacks in the Draft, including Baker Mayfield & Mason Rudolph, along with Josh Allen.